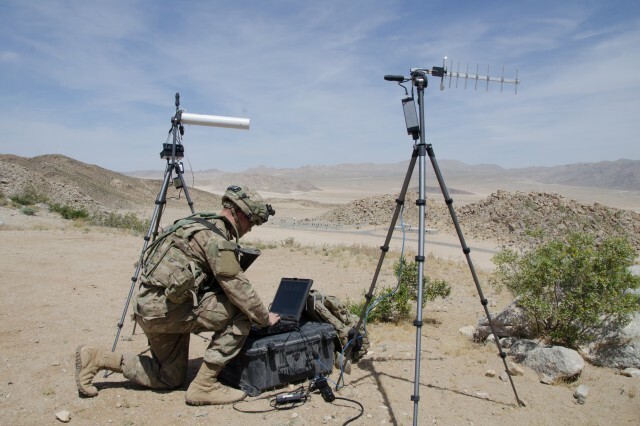 The Army Cyber Command-led initiative to develop Cyber-Electromagnetic Activities (CEMA) in Army tactical units has come a long way since its inception as a pilot program in 2015. As it nears the end of the first phase of the initiative, what started just two years ago as a pilot to explore building cyberspace capabilities and craft Army cyber doctrine, procedures and organization for maneuver units, has evolved exponentially into a broader spectrum encompassing the integration of cyber with vital related warfighting disciplines such as electronic warfare, information operations, intelligence and network operations. Along the way CEMA has become further integrated in maneuver unit operations as well, as it has increasingly demonstrated its value in providing commanders with offensive and defensive effects on par with battlefield enablers such as artillery and aviation. The most recent major building block in the CEMA Support to Corps and Below (CSCB) initiative centered on an April-May training rotation for the 2nd Armored Brigade Combat Team, 1st Infantry Division, at the National Training Center at Fort Irwin, Calif. That rotation built on two previous large-scale CSCB-related rotations at NTC, two at the Joint Readiness Training Center at Fort Polk, La., an exercise with the 75th Ranger Regiment, and participation in Army Network Integration Exercises. CEMA incorporation into the 2nd ABCT rotation -- dubbed "17-06" by the NTC -- actually started well before the brigade pulled into the dusty desert "box" at Fort Irwin, with ARCYBER elements supporting pre-rotation training at the brigade's home station at Fort Riley, Kansas. An Expeditionary Cyber Support Detachment composed alternately of Soldiers from two battalions of ARCYBER's 780th Military Intelligence Brigade began that training in November. But perhaps the most visible product of the evolution of the CSCB program has been the formation of Expeditionary Cyber Teams (ECTs), tactical force augmentation packages that bring together offensive and defensive cyber operations Soldiers, information operations planners, electronic warfare technicians and intelligence analysts. ECTs are tailorable and scalable to mission needs, to provide maneuver commanders with increased capabilities that enable dominance of the cyber, electromagnetic, and information environments on the battlefield. "By helping the brigade to seize and maintain the initiative in the cyberspace domain in decisive action against a near-peer threat, we can demonstrate how the integration of CEMA into unit operations gives the commander a clear tactical advantage as we develop DOTMLPF (Doctrine, Organization, Training, Materiel, Leadership and Education, Personnel, Facilities) solutions for the unit and the Army," said Lt. Col. Jonathan Burnett of ARCYBER's CSCB division. Brig. Gen. Joseph P. McGee, ARCYBER's deputy commanding general for operations, told reporters during the exercise that every major CSCB event has helped to refine the ECTs and the tools they use. "Every iteration of this gets better as we work through it, and so we have changed the construction of the teams -- the size and composition of them -- (and) we've changed the equipment that we bring out here," the general said. Sgt. Maj. Jesse Potter, operations sergeant major for the 780th, said when the CSCB pilot started it was focused on cyber, not CEMA, and the footprint for support was unsustainable, but advances in equipment have changed that. As one example, he noted that gear used by cyber Soldiers during the first rotation incorporating CSCB required four to six large carrying cases to transport and had a range of several hundred meters, but today the same technology is the size of a handheld radio and is effective for many miles. 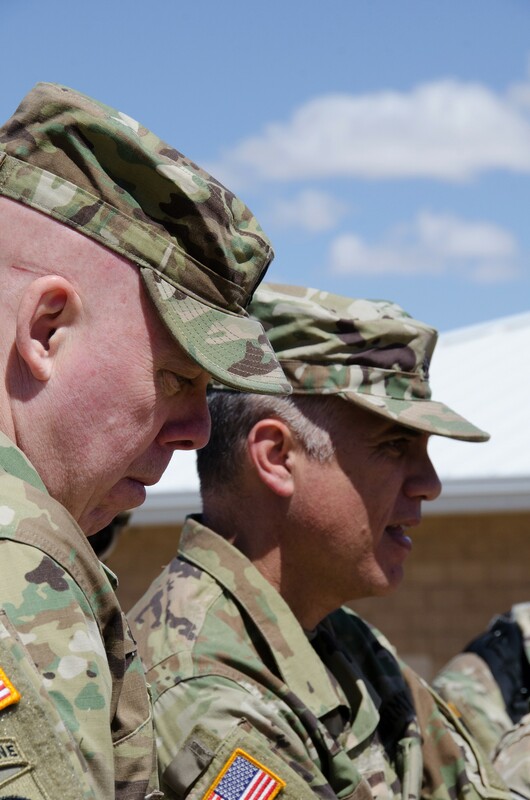 The sergeant major added that the ECT's integration of multiple effects during 17-06 had a noticeable impact on the 2nd ABCT's operations. 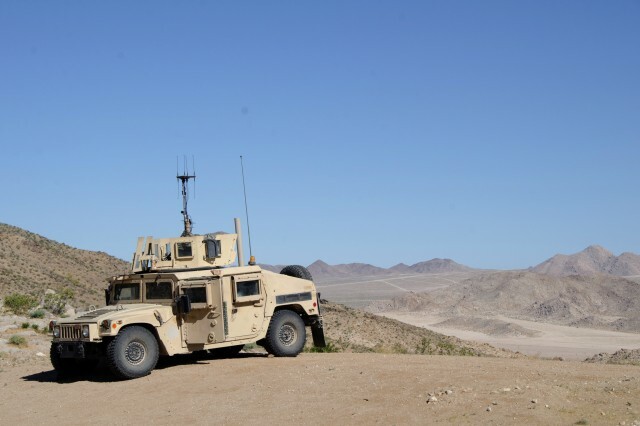 Leveraging the compounding effects of offensive cyber operations and electronic warfare attack capabilities, the brigade was able to set battlefield conditions and initiate combined arms maneuver. Potter said prior to this rotation such an integrated approach had never been attempted, and in their after-action reports on the exercise, brigade officials said the tactic was a critical element of their assault plan. In addition to ECT support from the 780th and defensive cyberspace Soldiers from the Army Cyber Protection Brigade, CSCB incorporation into 17-06 included elements of the ARCYBER staff who integrated with the 2nd ABCT and NTC's Operations Group for exercise support, to synchronize effects and to capture lessons learned, and an "enemy" cyber opposing forces element composed of members of the 1st Information Operations Command and NTC's "home team", the 11th Armored Cavalry Regiment. Underscoring the value of the CSCB effort to Army readiness, Army Chief of Staff Gen. Mark A. Milley paid a visit to cyber Soldiers at NTC during the rotation to get a first-hand look at how CEMA is being woven into tactical operations to protect friendly networks and weapons systems and take offensive cyber effects to an adversary to deny, disrupt and degrade the enemy's critical operations. 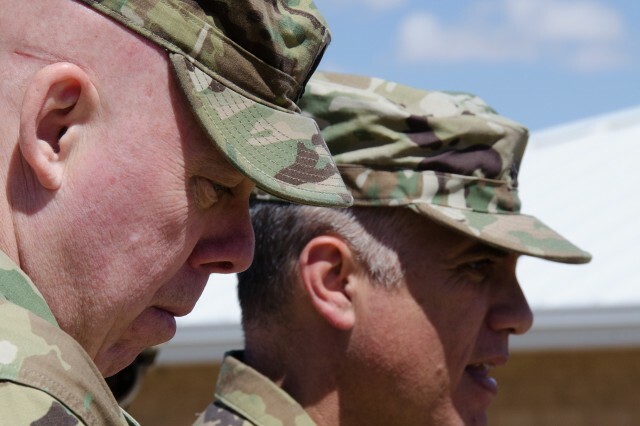 "Good decisive training taking place for @FightingFirst Soldiers at #NTC -- will have a direct impact on #Readiness for upcoming deployment," Milley tweeted later that day. Two weeks later, in testimony before the Senate Armed Services Committee, he named cyber and electronic warfare among his 10 modernization priorities for the Army, and reiterated the value of incorporating cyber into Army Combat Training Center rotations. "At home and abroad, the United States Army secures, operates, and defends its networks and conducts cyber operations against a growing array of sophisticated cyber adversaries," Milley told the committee. "These rotations challenge unit commanders at the brigade and battalion level with realistic training scenarios that integrate unmanned aerial vehicles, cyber, intelligence, electronic warfare, communication, fire support and aviation assets." "It's a challenge on the part of the (brigade) staff to understand those (CEMA) capabilities, identify the authorities for the execution of those capabilities, and figure out how to synchronize them into the fight," said Capt. George Puryear, a regimental planner for 11th ACR. "If we don't make a very deliberate effort as maneuver leaders to invest in this stuff, and understand its applications, we are going to get behind our threat and the threat's capability to do that." 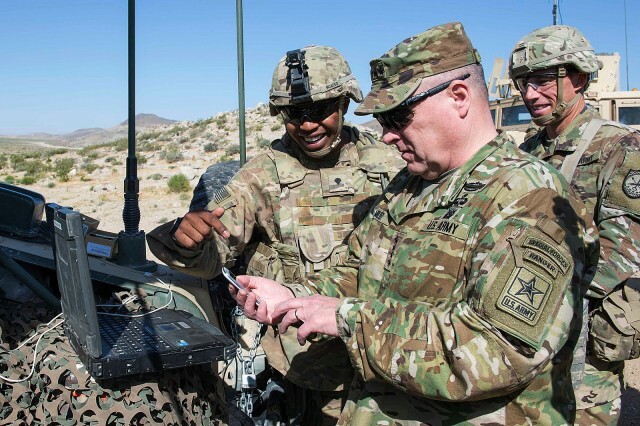 Army Cyber elements completed pre-rotation training and are supporting the current rotation at NTC for the 1st Brigade, 4th Infantry Division from Fort Carson, Colo.